We are stoked to have this seasonal from Dogfish Head Brewing. 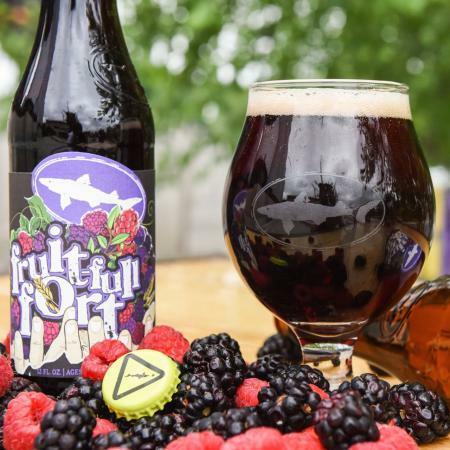 Fruit Full Fort is a seasonal, fruit forward take on Dogfish Head Fort. It clocks in at 18% and delivers a full bodied mouthfeel. We only have one log, and it’s limit 1 pour per customer, so stop in and try it today before this one is gone! A twist on their beloved Fort, Fruit-Full Fort is brewed with four types of berries - Raspberry, Blackberry, Boysenberry and Elderberry! This juicy blend of dark berries creates depth and complexity reminiscent of a jammy red wine. Along with adding a boatload of more berries this time around, they also punched up the malt bill with Munich malt to provide a firm backbone. The result provides balance to the tart flavors of a very berry blend.